In 1976, Robert Turner and Rury Holman developed the concept that fasting plasma insulin and glucose levels were determined, in part, by a hepatic-beta cell feedback loop [Abstract]. They postulated that elevated fasting glucose levels reflected a compensatory mechanism that maintained fasting insulin levels when there was a reduced insulin secretory capacity, and that fasting insulin levels were elevated in direct proportion to diminished insulin sensitivity. A mathematical feedback model based on these hypotheses was constructed to estimate the degrees of beta cell function and insulin sensitivity that would equate to the steady state plasma glucose and insulin levels observed in an individual [Metabolism 1979; 28:1086-96]. In 1985, David Matthews et al published an expanded and more comprehensive structural model known as the Homeostasis Assessment Model (HOMA). This model, written in Fortran, took greater account of peripheral glucose uptake and could use fasting levels of specific insulin or C-peptide in addition to RIA insulin [Diabetologia 1985; 28(7): 412-9]. As an alternative to running the Fortran computer model, a set of linear equations were also made available. These gave approximate values of %B and, instead of %S, HOMA IR (insulin resistance) which is the reciprocal of %S (100/%S). The equations have been used widely, particularly for estimates of beta cell function and insulin resistance in large-scale studies, but are not appropriate for use with currently available insulin assays. In 1998, Jonathan Levy et al published an updated HOMA model (HOMA2) which took account of variations in hepatic and peripheral glucose resistance, increases in the insulin secretion curve for plasma glucose concentrations above 10 mmol/L (180 mg/dL) and the contribution of circulating proinsulin [Diabetes Care 1998; 21: 2191-92]. The model was recalibrated also to give %B and %S values of 100% in normal young adults when using currently available assays for insulin, specific insulin or C-peptide. 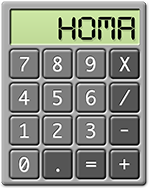 In 2004, the HOMA2 Calculator was released. This provides quick and easy access to the HOMA2 model for researchers who wish to use model-derived estimates of %B and %S, rather than linear approximations. It runs on a variety of computer platforms and can be downloaded from this site. For queries concerning the HOMA model and its appropriate use please read the FAQ. If your question remains unanswered, or for technical issues concerning the HOMA2 Calculator software, Email: homa.calculator@dtu.ox.ac.uk. 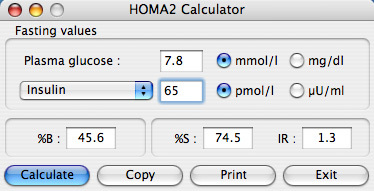 Today we release the latest software version of our HOMA2 Calculator, which enables researchers to quickly assess the level of insulin resistance and how well beta cells are working in people with diabetes. Entry of a comma (,) instead of a full stop or period (.) as a decimal point where appropriate for non-English versions of Windows.